Since 2012, the University has augmented its print edition of the Annual Report with a digital distribution. While online, it maintains the look and feel of a conventional physical magazine, complete with pages that “flip.” Some features include embedded video links. 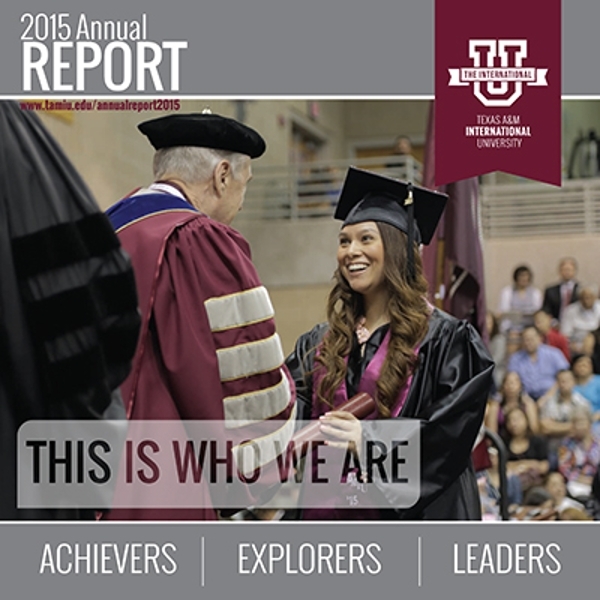 The 2015 Annual Report, themed “This is Who We Are,” offers a comprehensive look at 2015, highlighting student and faculty accomplishments and TAMIU’s role in building legacies, cultivating leadership, inspiring innovation and forging partnerships. TAMIU president Dr. Ray Keck said the Report underscores what TAMIU does. “The Report helps establish who we are: achievers, explorers and leaders -- but it also defines what we do: we achieve greatness, we challenge ourselves, we engage community, we lead daily and we give back. Seeing all that shared in the space of a year is an impressive offering that we’re excited to share with those we serve,” Dr. Keck said. For example, readers will learn about TAMIU’s national accolades accorded this year, its success on national competition and research stages, its employees’ enthusiastic embrace of wellness, students’ volunteer service impact worth in excess of $1.9 million, student-athletes’ success on and off the field, and pivotal Civil War history research penned by Regent’s Professor Dr. Jerry Thompson, among other fascinating stories. The 32-page Report also profiles the University’s student body and other key performance measures, and recognizes donors and partners that help fuel building, research and scholarship. It also includes links to expanded news features, video and photo galleries and can be easily printed, emailed or embedded in social media for sharing. Last year’s Annual Report, also available online, garnered regional, state and national awards. The Spring Semester 2016 at TAMIU begins Wednesday, January 20, 2016. Online registration is underway at tamiu.edu. University offices close for a State-authorized holiday at noon on Wednesday, Dec. 23 and re-open Monday, Jan. 4. For more information on TAMIU, call the Office of Public Relations, Marketing and Information Services, email prmis@tamiu.edu, click on tamiu.edu or come by Sue and Radcliffe Killam Library, room 268. University information is also available online at tamiu.edu and on the University’s social media sites on Facebook, Instagram, Twitter and YouTube.